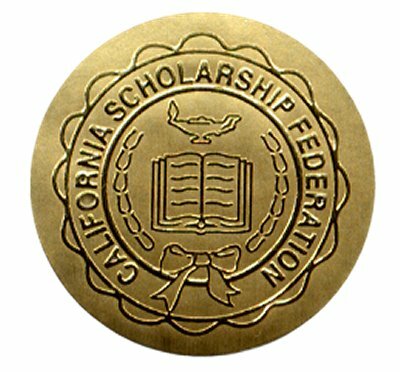 The California Scholarship Federation (CSF) started in 1921 by Charles F. Seymour, seeks to recognize students living in the state of California who possess high standards in academic scholarship, community service and citizenship. Members of the California Scholarship Federation are eligible for a variety of tuition scholarships available at universities across the state and in select colleges nationwide. Approximately one thousand chapters are located in various secondary schools across the state. The organization continues to promote the education of academically motivated students, encouraging them to get involved in their communities through volunteer service. 1. You must earn a minimum of 10 points from last semester's grades. The first 4 points must be from LIST I (unless you are a senior applying for membership in January or June). The remaining points may come from any LIST (I, II, or III). 2. You must use no more than 5 courses to qualify. 3. No CSF points are given for physical education, courses in lieu of physical education, subjects repeated to improve a grade, courses involving office/teachers aids, and courses taken on a pass/fail or no credit basis. One additional point shall be granted for a grade of A or B in AP or Honors courses, up to a maximum of two such points per semester. Grade D or F in any course, even in one you cannot use to qualify, disqualified you. 2. You mush reapply each semester.